Do you need a printer with superior color capabilities? If your business is in need or making the best, and biggest photo realistic prints then Xerox has the answer for you. The Xerox WorkCentre 7556 Color Multifunction Printer has all you need to make your color prints the envy of all your colleagues. With the Xerox WorkCentre 7556 you are able to tackle any color print job that you can imagine. It prints brilliantly crisp images with 1200 x 2400 dpi to make all your images look photorealistic. This tabloid sized printer can take on even the large prints jobs. 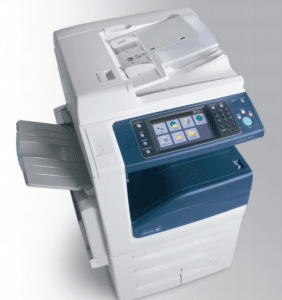 The Xerox WorkCentre 7556 is capable of printing sizes up to 12.6 x 19 inches and on paper weights up to 300 gsm. You will be able to make the best looking prints that your business needs to thrive. Xerox knows that it’s not all about color, and that having a fast printer can be just as important as having great resolution. That’s why they made the Xerox WorkCentre 7556 maintain print speeds of between 35-50 prints per minute in color, and up to 55 prints per minute in black and white. You won’t have to sacrifice speed to get power with the Xerox WorkCentre 7556. The Xerox WorkCentre 7556 is the perfect solution for businesses that are design oriented. It has some of the highest print resolution available, while offering an easy to use system that will allow you to have the best looking prints for your business needs. Call Denver Copier today to learn more about the Xerox WorkCentre 7556 and if it’s right for you.